Los Angeles Rams' Jared Goff (16) throws during the first half of the NFL Super Bowl 53 football game between the Los Angeles Rams and the New England Patriots, Feb. 3, 2019, in Atlanta, Georgia. This is the third straight Super Bowl for the Patriots and the 11th time overall the team has played for the coveted Vince Lombardi Trophy. They lost last year's game to the Philadelphia Eagles. 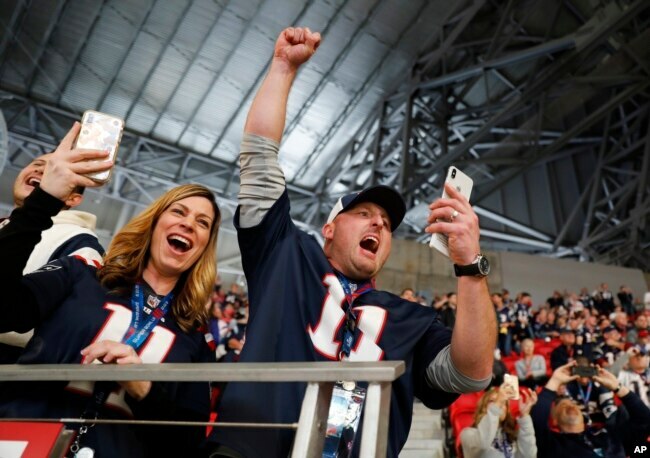 Fans cheer as the New England Patriots' Tom Brady takes the field before the NFL Super Bowl LIII football game between the Los Angeles Rams and the New England Patriots, Feb. 3, 2019, in Atlanta, Georgia. 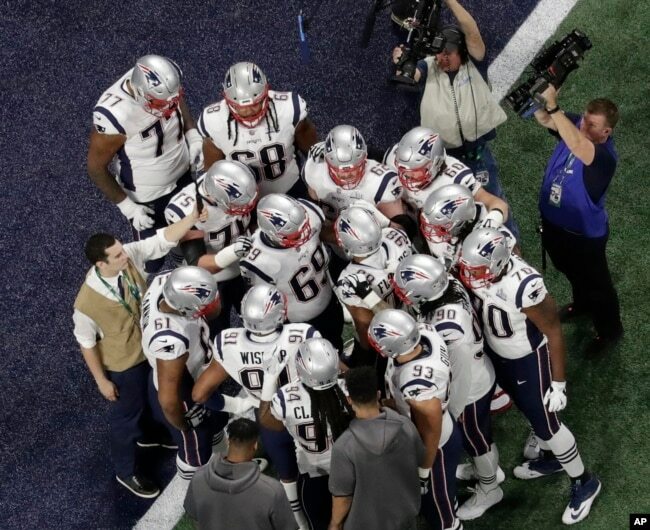 The New England Patriots huddle before the NFL Super Bowl football game between the Los Angeles Rams and the New England Patriots, Feb. 3, 2019, in Atlanta. It's the fourth appearance for the Rams, who last played in the Super Bowl in 2002 when they were defeated by the Patriots. At that time the Rams were based in St. Louis. 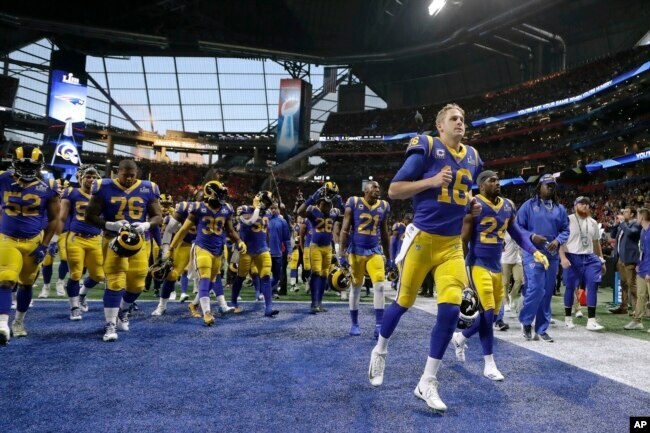 Los Angeles Rams players are seen before the NFL Super Bowl football game between the Rams and the New England Patriots, Feb. 3, 2019, in Atlanta. President Donald Trump is no exception. He said he expects as many as 700 people at his Super Bowl party at his Mar-a-Lago resort in Florida. The president is forecasting a Patriots win, saying the team has "great chemistry." 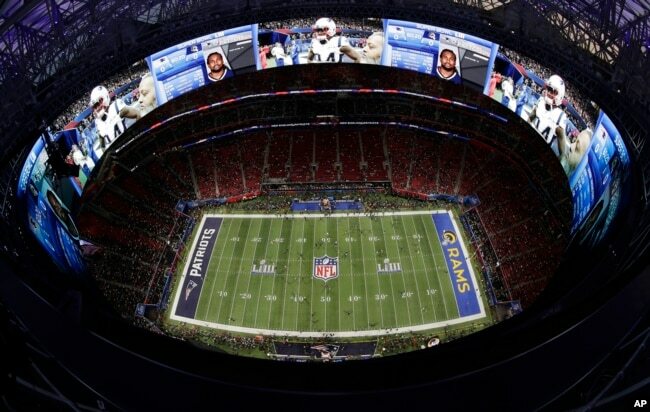 Players warm up ahead of the NFL Super Bowl football game between the Los Angeles Rams and the New England Patriots, Feb. 3, 2019, in Atlanta, Georgia.